"Rockwool" redirects here. For the manufacturer, see Rockwool International. Building joint with incomplete firestop made of mineral wool packing that still requires topcaulking. Mineral wool is any fibrous material formed by spinning or drawing molten mineral or rock materials such as slag and ceramics. Applications of mineral wool include thermal insulation (as both structural insulation and pipe insulation, though it is not as fire-resistant as high-temperature insulation wool), filtration, soundproofing, and hydroponic growth medium. Mineral wool is also known as mineral fiber, mineral cotton, mineral fibre, man-made mineral fibre (MMMF), and man-made vitreous fiber (MMVF). Specific mineral wool products are stone wool and slag wool. Europe also includes glass wool which, together with ceramic fiber, are completely man-made fibers. Slag wool was first made in 1840 in Wales by Edward Parry, "but no effort appears to have been made to confine the wool after production; consequently it floated about the works with the slightest breeze, and became so injurious to the men that the process had to be abandoned". A method of making mineral wool was patented in the United States in 1870 by John Player and first produced commercially in 1871 at Georgsmarienhütte in Osnabrück Germany. The process involved blowing a strong stream of air across a falling flow of liquid iron slag which was similar to the natural occurrence of fine strands of volcanic slag from Kilauea called Pele's hair created by strong winds blowing apart the slag during an eruption. American chemical engineer Charles Corydon Hall in 1897 developed a technology to convert molten limestone into fibers and initiated the rock wool insulation industry in America. According to a mineral wool manufacturer, the first mineral wool intended for high-temperature applications was invented in the United States in 1942, but was not commercially viable until approximately 1953. 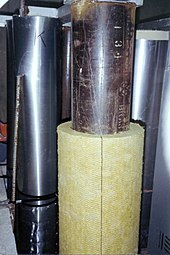 More forms of mineral wool become available in the 1970s and 1980s. High-temperature mineral wool is a type of mineral wool created for use as high-temperature insulation and generally defined as being resistant to temperatures above 1,000 °C. This type of insulation is usually used in industrial furnaces and foundries. Because high-temperature mineral wool is costly to produce and has limited availability, it is almost exclusively used in high-temperature industrial applications and processes. Classification temperature is the temperature at which a certain amount of linear shrinkage (usually two to four percent) is not exceeded after a 24‑hour heat treatment in an electrically heated laboratory oven in a neutral atmosphere. Depending on the type of product, the value may not exceed two percent for boards and shaped products and four percent for mats and papers. The classification temperature is specified in 50 °C steps starting at 850 °C and up to 1600 °C. The classification temperature does not mean that the product can be used continuously at this temperature. In the field, the continuous application temperature of amorphous high-temperature mineral wool (AES and ASW) is typically 100 °C to 150 °C below the classification temperature. Products made of polycrystalline wool can generally be used up to the classification temperature. There are several types of high-temperature mineral wool made from different types of minerals. The mineral chosen results in different material properties and classification temperatures. AES wool consists of amorphous glass fibres that are produced by melting a combination of calcium oxide (CaO−), magnesium oxide (MgO−), and silicon dioxide (SiO2). Products made from AES wool are generally used in equipment that continuously operates and in domestic appliances. AES wool has the advantage of being bio-soluble—it dissolves in bodily fluids within a few weeks and is quickly cleared from the lungs. Alumino silicate wool, also known as refractory ceramic fibre (RCF), consists of amorphous fibres produced by melting a combination of aluminum oxide (Al2O3) and silicon dioxide (SiO2), usually in a weight ratio 50:50 (see also VDI 3469 Parts 1 and 5, as well as TRGS 521). Products made of alumino silicate wool are generally used at application temperatures of greater than 900 °C for equipment that operates intermittently and in critical application conditions (see Technical Rules TRGS 619). Polycrystalline wool consists of fibres that contain aluminum oxide (Al2O3) at greater than 70 percent of the total materials and is produced by sol–gel method from aqueous spinning solutions. The water-soluble green fibres obtained as a precursor are crystallized by means of heat treatment. Polycrystalline wool is generally used at application temperatures greater than 1300 °C and in critical chemical and physical application conditions. Kaowool is a type of high-temperature mineral wool made from the mineral kaolin. It was one of the first types of high-temperature mineral wool invented and has been used into the 21st century. It can withstand temperatures close to 3,000 °F (1,650 °C). Stone wool is a furnace product of molten rock at a temperature of about 1600 °C, through which a stream of air or steam is blown. More advanced production techniques are based on spinning molten rock in high-speed spinning heads somewhat like the process used to produce cotton candy. The final product is a mass of fine, intertwined fibres with a typical diameter of 2 to 6 micrometers. Mineral wool may contain a binder, often a terpolymer, and an oil to reduce dusting. Though the individual fibers conduct heat very well, when pressed into rolls and sheets, their ability to partition air makes them excellent insulators and sound absorbers. 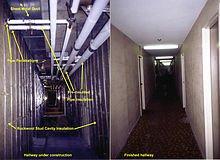 Though not immune to the effects of a sufficiently hot fire, the fire resistance of fiberglass, stone wool, and ceramic fibers makes them common building materials when passive fire protection is required, being used as spray fireproofing, in stud cavities in drywall assemblies and as packing materials in firestops. Other uses are in resin bonded panels, as filler in compounds for gaskets, in brake pads, in plastics in the automotive industry, as a filtering medium, and as a growth medium in hydroponics. Mineral fibers are produced in the same way, without binder. The fiber as such is used as a raw material for its reinforcing purposes in various applications, such as friction materials, gaskets, plastics, and coatings. High-temperature mineral wool is used primarily for insulation and lining of industrial furnaces and foundries to improve efficiency and safety. It is also used to prevent the spread of fire. 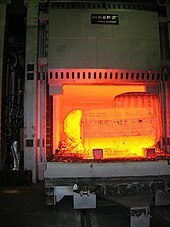 The use of high-temperature mineral wool enables a more lightweight construction of industrial furnaces and other technical equipment as compared to other methods such as fire bricks, due to its high heat resistance capabilities per weight, but has the disadvantage of being more expensive than other methods. The International Agency for Research on Cancer (IARC) has reviewed the carcinogenicity of man-made mineral fibres in October 2002. The IARC Monograph's working group concluded only the more biopersistent materials remain classified by IARC as "possibly carcinogenic to humans" (Group 2B). These include refractory ceramic fibres, which are used industrially as insulation in high-temperature environments such as blast furnaces, and certain special-purpose glass wools not used as insulating materials. In contrast, the more commonly used vitreous fibre wools produced since 2000, including insulation glass wool, stone wool, and slag wool, are considered "not classifiable as to carcinogenicity in humans" (Group 3). High biosoluble fibres are produced that do not cause damage to the human cell. These newer materials have been tested for carcinogenicity and most are found to be noncarcinogenic. IARC elected not to make an overall evaluation of the newly developed fibres designed to be less biopersistent such as the alkaline earth silicate or high-alumina, low-silica wools. 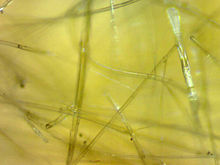 This decision was made in part because no human data were available, although such fibres that have been tested appear to have low carcinogenic potential in experimental animals, and because the Working Group had difficulty in categorizing these fibres into meaningful groups based on chemical composition." The European Regulation (CE) n° 1272/2008 on classification, labelling and packaging of substances and mixtures updated by the Regulation (CE) n°790/2009 does not classify mineral wool fibres as a dangerous substance if they fulfil criteria defined in its note Q. Due to the mechanical effect of fibres, mineral wool products may cause temporary skin itching. To diminish this and to avoid unnecessary exposure to mineral wool dust, information on good practices is available on the packaging of mineral wool products with pictograms or sentences. Safe Use Instruction Sheets similar to Safety data sheet are also available from each producer. People can be exposed to mineral wool fibers in the workplace by breathing them in, skin contact, and eye contact. The Occupational Safety and Health Administration (OSHA) has set the legal limit (permissible exposure limit) for mineral wool fiber exposure in the workplace as 15 mg/m3 total exposure and 5 mg/m3 respiratory exposure over an 8-hour workday. The National Institute for Occupational Safety and Health (NIOSH) has set a recommended exposure limit (REL) of 5 mg/m3 total exposure and 3 fibers per cm3 over an 8-hour workday. Registration, Evaluation, Authorisation and Restriction of Chemicals (REACH) is a European Union regulation of 18 December 2006. REACH addresses the production and use of chemical substances, and their potential impacts on both human health and the environment. A Substance Information Exchange Forum (SIEF) has been set up for several types of mineral wool. AES, ASW and PCW have been registered before the first deadline of 1 December 2010 and can, therefore, be used on the European market. On 13 January 2010, some of the aluminosilicate refractory ceramic fibres and zirconia aluminosilicate refractory ceramic fibres have been included in the candidate list of Substances of Very High Concern. In response to concerns raised with the definition and the dossier two additional dossiers were posted on the ECHA website for consultation and resulted in two additional entries on the candidate list. This actual (having four entries for one substance/group of substances) situation is contrary to the REACH procedure intended. Aside from this situation, concerns raised during the two consultation periods remain valid. Based on the total experience with humans and the findings of scientific research (animals, cells), it can be concluded that elongated dust particles of every type have in principle the potential to cause the development of tumours providing they are sufficiently long, thin and biopersistent. According to scientific findings inorganic fibre dust particles with a length-to-diameter ratio exceeding 3:1, a length longer than 5 μm (0.005 mm) and a diameter smaller than 3 μm (WHO-Fibres) are considered health-critical. High-temperature mineral wool processed to products contain fibres with different diameters and lengths. During handling of high-temperature mineral wool products, fibrous dusts can be emitted. These can include fibres complying with the WHO definition. The amount depends on how the material is handled. High concentrations are usually found during removal of after-use high-temperature mineral wool and also during mechanical finishing activities and in the assembly of modules. Where fibre products are mechanically abraded by sawing, sanding, routing, or other machining the airborne fibre concentrations will be high if uncontrolled. Dust release is further modified by the intensity of energy applied to the product, the surface area to which the energy is applied, and the type, quantity and dimensions of materials being handled or processed. Dispersion or dilution of dust produced depends on the extent of confinement of the sources and the work area, as well as the presence and effectiveness of exhaust ventilation. Amorphous high-temperature mineral wool (AES and ASW) are produced from a molten glass stream which is aerosolised by a jet of high-pressure air or by letting the stream impinge onto spinning wheels. The droplets are drawn into fibres; the mass of both fibres and remaining droplets cool very rapidly so that no crystalline phases may form. 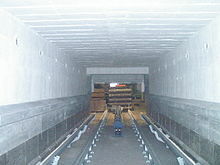 When amorphous high-temperature mineral wool are installed and used in high-temperature applications such as industrial furnaces, at least one face may be exposed to conditions causing the fibres to partially devitrify. Depending on the chemical composition of the glassy fibre and the time and temperature to which the materials are exposed, different stable crystalline phases may form. In after-use high-temperature mineral wool crystalline silica crystals are embedded in a matrix composed of other crystals and glasses. Experimental results on the biological activity of after-use high-temperature mineral wool have not demonstrated any hazardous activity that could be related to any form of silica they may contain. ^ a b "Mineral Wool or Mineral Cotton", Appleton's Annual Cyclopedia and Register of Important Events of the Year 1891. New Series vol. 16. New York: 1892. 528. Print. ^ a b "HISTORY OF HTIW PRODUCTS". ^ a b "High temperature insulation wool - Production, Properties, Classification,". insulatioNet.com. Retrieved 2018-06-24. ^ "Biosolubility FAQ's". ICANZ. Retrieved 2019-01-19. ^ Tom Alexander; Don Parker (1994). The Best of Growing Edge. New Moon Publishing, Inc. ISBN 978-0-944557-01-3. ^ "CDC – NIOSH Pocket Guide to Chemical Hazards – Mineral wool fiber". www.cdc.gov. Retrieved 2015-11-27. Wikimedia Commons has media related to Mineral wool. Wikisource has the text of a 1905 New International Encyclopedia article about Mineral wool. This page was last edited on 3 April 2019, at 11:05 (UTC).